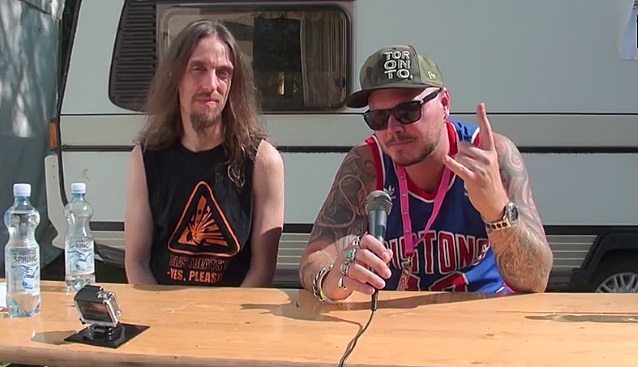 Kaaos TV conducted an interview with SOILWORK singer Björn "Speed" Strid and drummer Dirk Verbeuren before the band's July 26 performance at Qstock festival in Oulu, Finland. You can now watch the chat below. Asked about the status of SOILWORK's upcoming first-ever concert DVD, which was filmed on March 21 at Circus in Helsinki, Finland, Dirk said: "We're in the middle of pretty much editing it. It's looking really good already. We're just kind of working on the details to get all the bonus material together; we actually did some interviews this morning. And it'll be a few more weeks, at least, until it's complete. But we're really happy with how it came out so far." Björn added: "It [was] the first time that we really performed songs from each and every album, including the latest double album as well. So it's gonna be a very long show. So I think it's gonna be a very cool mix of songs from our entire career." SOILWORK's DVD is being produced by Jouni Markkanen and directed by Ville Lipiäinen, who also helmed the most recent NIGHTWISH DVD, "Showtime, Storytime". SOILWORK was forced to cancel its appearance at this year's Rockharz Open Air festival on July 11 in Ballenstedt, Germany due to a serious back injury suffered by Strid. SOILWORK's ninth studio and first dual-disc album, "The Living Infinite", sold around 7,800 copies in the United States in its first week of release to enter The Billboard 200 chart at position No. 60. The effort also landed at No. 11 on the Independent Albums chart, and No. 2 on the Hard Music chart. "The Living Infinite" entered the iTunes Metal Top Albums chart at No. 1 and was the No. 1 most added album on the CMJ radio chart. "The Living Infinite" was produced by Jens Bogren (OPETH, AMON AMARTH, BLOODBATH) and boasts artwork by MNEMIC's Mircea Gabriel Eftemie. The CD features Justin Sullivan — lead singer of the English band NEW MODEL ARMY — as a guest vocalist on the track "The Windswept Mercy" and also marks the recording debut of longtime SOILWORK touring guitarist David Andersson (also of THE NIGHT FLIGHT ORCHESTRA).